When you begin to use the Map Viewer you must first get acquainted with the user interface. It is a part of platform which offers complete oversight of projects. Log In and My Account – You need to log in using your User Name and Password to access Map Viewer. After that you will be able to use the application fully. After logging in, you will be able to modify your user account. Tool Ribbon – Here we offer complete access to the application’s features. 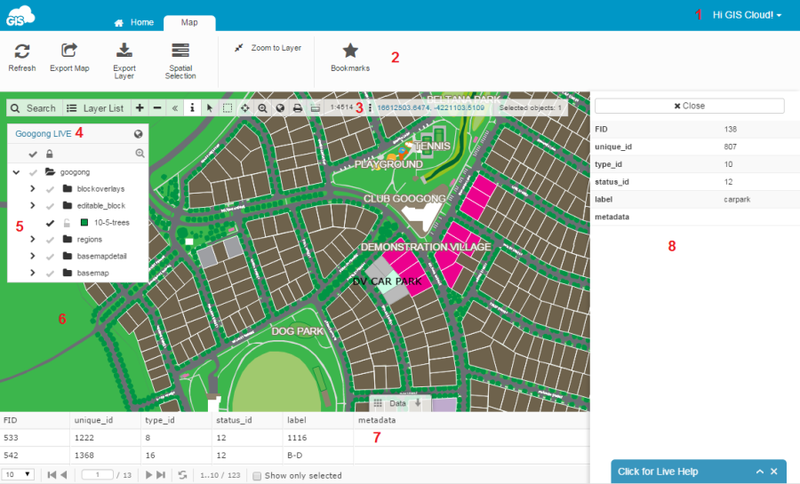 Toolbar – Provides the tools needed for basic operations with maps. Toolbar functions are described in the separate chapter Toolbar. Map Name bar – Displays the map name as a link. You can send someone a link to the map by using the address that the link points to, or you can refresh the map by clicking on the link. Drag and drop ordering – Control layer display order. Lock layers – Prevent selecting features within selected layer. Layer visibility – Toggles the display of the selected layer. Transparency – Click on the layer drop down to set layer transparency. Map View – Map display of visible layers and cartographic features. Data Grid– Table displaying all attribute records and fields of a selected dataset. Info Panel – View info about selected feature.